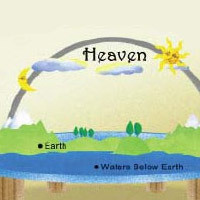 The Bible seems in many places to point to a Flat Earth model. One such Bible verse is found in the book of Job. Both 'world' and 'earth' are mentioned here, as well as the words 'upon' and 'face'. When there is double mention, there is special emphasis. And in this case it is the world - the earth - being described. As for the words 'upon' and 'face', the definitions are below. 1. Upon - On the surface of a thing. 2. Face - The plane surface of a solid. "...That they may do whatsoever he commandeth them upon the face of the world in the earth."